Practically everybody in this area knows about the Historic County Courthouse in Yanceyville, with its striking design and stucco walls with gold trim, and if they are lucky have actually been inside to see that its beauty is not just skin deep. This piece of architectural wonder and history conceals yet another treasure in the town of Yanceyville. It doesn’t do it purposefully. It just happens to stand in front of it. In fact, the courthouse is surrounded by treasures thanks in great part to the Caswell Horticulture Club. The Caswell Horticulture Club was born in 1997 when a small group of volunteers came together with a purpose “to preserve, beautify, and historically restore the gardens in downtown Yanceyville.’ Their first project, and still a very high priority for them, was the Yanceyville Town Square which lies at the exact geographic center of the county and is directly in front of the Courthouse. They replanted some of the shrubbery here and maintain twice yearly plantings of annuals. The iron gates which allow entrance to the Courthouse grounds are the beginning of the Memorial Path and the Veterans Walk. The Memorial Path is to the left leads to the Memorial Garden on the east side of the Courthouse. This walkway is made up of bricks, which are in memory of or honor of loved ones and friends. The bricks in this pathway celebrate marriages, births, graduations, or just messages of friendship. Anyone may purchase bricks to be engraved and placed in this walkway. The Memorial Garden contains memorials to many citizens of the county in the form of dedicated benches and engraved bricks in its courtyard. Planting in this area includes boxwoods, hollies, and crape myrtles which were staple landscape items in many of the historic homes in the county. In the center of garden stands an armillary sphere which was donated by the Swann Forge and serves as the focal point of this garden. The benches offer a place of rest and a vantage point to view the beauty and peacefulness of this area. To the right of the iron gates is the Veterans’ Walk. This walkway connects the Courthouse to the Agriculture Building and is made up of bricks engraved in memory and honor of local servicemen who served their country in wars ranging from the 18th century until the present. It also leads into the Courtyard Garden. Located on the west side of the Courthouse this area was designed to offer a pleasant sitting area between the two building. There is a central brick patio composed of engraved bricks with a large old millstone in the center. 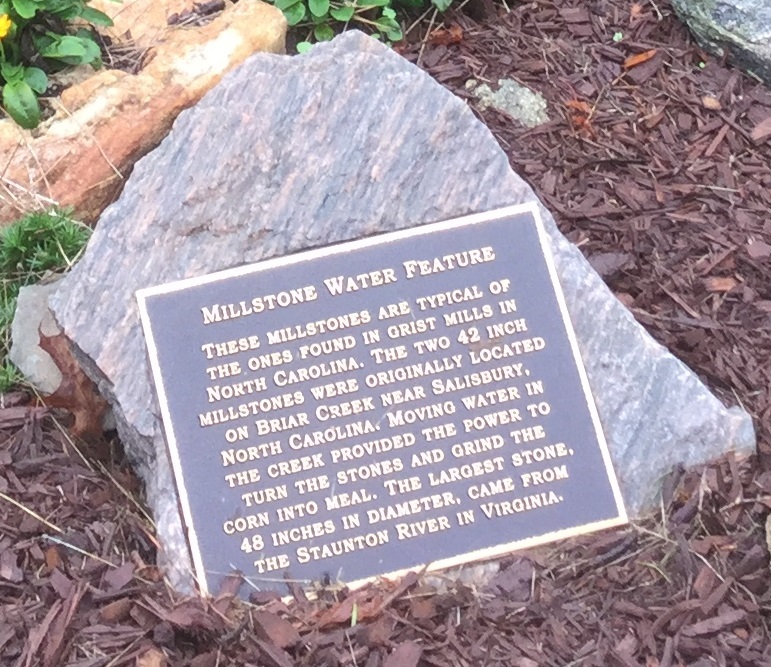 The millstone was donated by the Honorable and Mrs. James Long from the family mill located in the Milton area. This area is landscaped with low maintenance evergreens, knockout roses, lavender, and other perennials. The Old Jail and the Poteat Schoolhouse stand behind the Courtyard Garden and stand as sentinels leading to the Arboretum. Before 2004 the area behind the Courthouse served as a county dumping ground and somewhere along the way came to be covered in golden bamboo. Perhaps this planted intentionally to screen the area and make it more aesthetically appealing or perhaps like many other things it just started to grow and thrive there. Whichever the case the invasive bamboo was a problem. 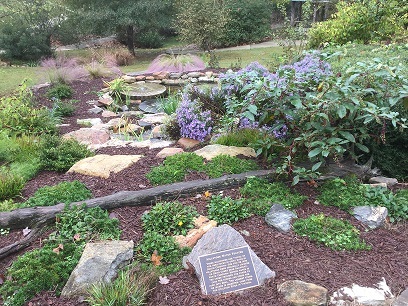 The Horticulture Club which had been honored in 2001 with the prestigious Minnett Duffy Landscape Preservation Award from Preservation North Carolina and had completed the Memorial Garden project at the Courthouse were ready for another project. They once again call Yancey Smith, one of their original members who had directed the Memorial Garden project to head this project. “The golden bamboo was a real challenge. We cut, we chopped, and we burned, and you know that stuff is growing in the landfill today after being dumped there.” Listening to Yancey talk about this and watch her smile as she said it made it evident that this was a labor of love for her and all others involved in the project. 2004 saw the beginning of the project with the clearing of the bamboo. The club realized that this would be quite an undertaking physically and financially but felt well up the challenge. Steve Thompson, forest ranger in the area at the time, suggested that Yancey apply for the Urban Forestry Grant. As project manager, Yancey was writer and decision -maker for how to spend the grants. The Horticulture Club could overmatched the grant through their fund-raising efforts with almost all the businesses of Yanceyville making donations. By 2005 it was time to find a plan for the plan. OBS Landscape Architects of Raleigh, with input from a local committee, drew up the plans for the arboretum. The club’s vision was for a “professionally designed facility with modern guest amenities.” Brian Starkey took the vision of the club to heart and realizing their limited resources and along with his team invested over 100 hours to creating a plan that any place would be proud of. The plan consisted of over half a dozen native plant zones. Included were theme areas of Evergreen, Woodland Bosque, Bird and Butterfly, and Woodland Edge gardens. Sensing the dedication of the club the firm offered their services for a very attractive and manageable fee. Plan in hand 2006 became the year of the first planting. There were 22 or more large trees, all donated, planted in the arboretum that year. As luck would have it, it was a year of drought. Yancey tried keeping the trees watered, but less than have the trees survived. Eleven years later, how those trees have grown. Yancey can tell you which of the trees were among the first planted, what they are, and who donated them. Walking with her through the arboretum is like walking with a proud parent among the artifacts of a successful child. The arboretum was definitely a labor of love. Now it looks like a million-dollar project, but it is more than that. 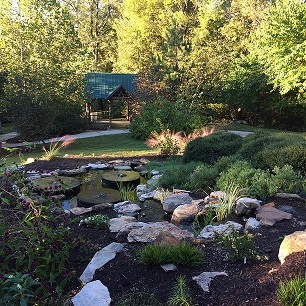 The North Carolina Cooperative Extension agency in Public Gardens section of their website says this “An all native arboretum and park where tree and plants are grown for exhibition and study. Located on county property in the Yanceyville National Historic District, behind the storied Caswell County Courthouse. Designed by OBS Landscape Architects of Raleigh, the arboretum is 2 acres of diverse native plantings that emphasizes biodiversity and wildlife sustainability. A ½ mile paved trail meanders through the arboretum’s featured gardens, a butterfly garden, an evergreen garden, and a young pine grove. There are benches placed throughout and includes a rustic shelter.” It was by designed and has been kept this way that only native plants, trees, and shrubs would be part of this area. Also it was by design to plant food in the form of berries and nuts for native area wildlife. This rustic shelter was designed by Yancey and the cedar which is built from came from her husband’s farm there in the county. Lowes delivered the tin for roof and club built the shelter. It was completed in June 2009. Soon metal artwork will add to the beauty of this man-made structure amidst all the natural beauty. The most recent feature added to the garden in a water feature including old mill wheels like the one found in the center of the Courtyard Garden. Native plants and grasses planted amid the rocks and moving water create a cool respite from even the hottest of summer days. But words cannot do this arboretum justice. It has to be experienced. Open 365 days a year, it is a place to feel at peace once again with self and nature. A deer or two may meander in and share the space for a bit or perhaps a group of wild turkeys. For sure birds will be there along with other small creatures such as rabbits and squirrels. They know a good place when they find it. 1997 was a very good year for not only Yanceyville and Caswell County but for all of us who come into or live in this area. This group, the Caswell Horticulture Club, has given and us and continues to give us the most precious of gifts. Being excellent stewards of the natural beauty around us. Visit the Arboretum and surrounding gardens soon. Look for the impressive Courthouse in downtown Yanceyville and then to the front, the left, the right, and follow that path to the back. An awesome place awaits you.